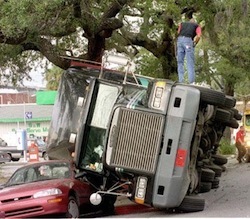 Century City Truck Accident Injury Lawyers- Over 40 Years of Experience You Can Trust! Compassionate Personal Injury Truck Accident & Car Accident Lawyers in Century City, California Provide a Free Case Evaluation! If you have been injured in a truck and automobile accident, or need assistance in personal injury claims or wrongful death claims of a family member or a loved one in Century City, California, then please just turn to our experienced truck accident & car accident personal injury lawyers. We also provide legal services for auto accidents, motorcycle accidents, bicycle accidents, pedestrian accidents, uninsured motorist (UM), underinsured motorist (UIM) and wrongful death claims. Over 1.41 million drivers were arrested in 2010 for driving under the influence of alcohol or narcotics. The threat of death or injury posed by trucking accidents is staggering. The substantial volume of commercial vehicles presents a problem for motorists who must share congested highways with large trucks, big rigs, semis, semi-trailer trucks, tractor-trailers and 18-wheelers. Truck drivers are often negligent, inattentive, fatigued and/or rash in their truck handling. This neglectful behavior has been proven disastrous for car, motorcycle, bicycle and other the small vehicle drivers and their passengers. If you or a loved one had a tragic truck accident in Century City, Los Angeles, West Los Angeles, or another other place in California, owing to negligence of a truck driver, contact our experienced and compassionate truck accident personal injury attorneys and law offices for a FREE CONSULTATION and CASE EVALUATION. We are very experienced personal injury and truck accident injury lawyers, who work towards preserving your rights to obtain maximum compensation for your physical damages, emotional distress, and financial losses and damages. Century City is a 176-acre commercial and residential district in the Los Angeles Westside. Based on the Los Angeles Times’ Mapping L.A. project, Century City is bounded on the northwest by Westwood (where UCLA is located), on the southeast by beautiful Cheviot Hills, on the west by West Los Angeles and on the east by infamous Beverly Hills, Calif.
Our lawyers provide truck accident and personal injury legal services in Century City, West Los Angeles, all of Los Angeles County and other parts of California. You can get more information about our experienced truck accident personal injury & wrongful death lawyers and law offices by visiting our home page and our lawyer profiles. Our 40 years of expertise in handling truck, car, motorcycle, bicycle and pedestrian accident and other personal injury cases in Century City, Los Angeles and throughout California has given us the recognition of PERSONAL INJURY LAW FIRM OF YEAR 2011 and again in 2014. In fact, we have recovered more than $100,000,000.00 in funds for our clients in personal injury claims and wrongful death claims. Our aggressive yet sympathetic lawyers have resolved countless cases and work extremely hard to make the process easy and straightforward for our clients, the victims and their loved ones. In addition, our lawyers and legal team provide immediate help with medical care (usually without any expense from you until the case is resolved), medical specialists, property damage repair and loan cars, and settlement. Our personal injury attorneys strive to recover the full compensation our clients deserve for their serious injuries resulting from truck & car collisions, including all damages allowed under California law for the injuries suffered and all losses incurred. Please get in touch with our Century City truck accident injury lawyers and our legal team now for a completely FREE CONSULTATION and CASE EVALUATION. If we think you have a good case, we will gladly represent you. If we think otherwise, we shall be direct and honest with you and tell you. We urge you to call us to speak to one of our experienced truck accident injury lawyers or any member of our legal team at 818-222-3400 (after hours, please press 1) or by calling us on our Toll-Free number - 866 INJURY 2 or 866-465-8792 (after hours, again please press 1). Moreover, you can email us at info@WalchLaw.com or just use our easy contact form to tell us about your case. Our consultation is absolutely FREE and we work on a contingency fee basis, so there’s NO fee until you WIN! Please call or email us now – You will be glad that you did!